This year Christmas kind of snuck up on me. I did zero decorating, made one type of cookie and didn't send out cards. On the bright side, this means there is very little to clean up and store away. My parents did give me a creche to use with one of my Nativity sets. It is the manger that was in our house when I was growing up. My dad made it based on the pattern of one made by my maternal grandfather. Next year I promise to get some straw for it, so it doesn't look so bleak. 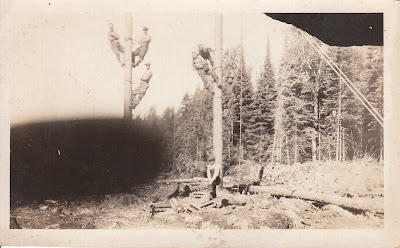 A couple of days ago I posted about the project that I am working on sorting through my grandfather's photos. 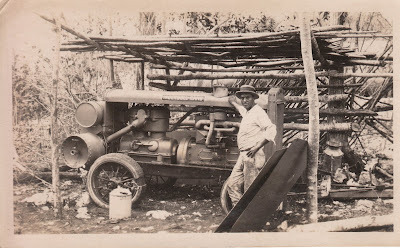 From 1920 - 1926, he worked for a company called Phoenix Utility putting in the electrical infrastructure in Mexico, British Honduras and Cuba. 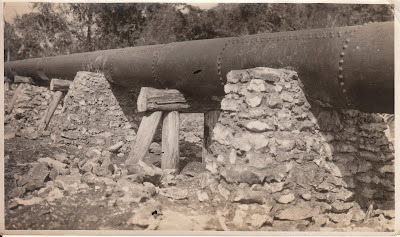 This was following the Mexican Revolution and there was a boom in new construction. 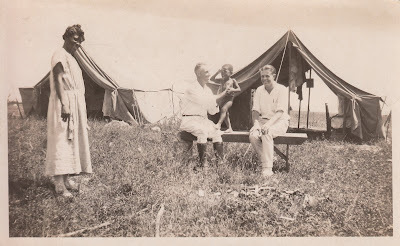 My grandfather eventually contracted malaria and returned to Minnesota to recover. My dad tells a story told to him by his father. 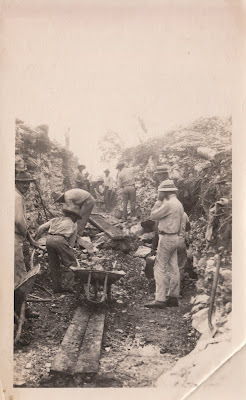 One day while working in Mexico the Mexican workers got wind of a revolutionary band making it's way towards camp. Sensing trouble and deciding they wanted no part of it, they made themselves scarce. 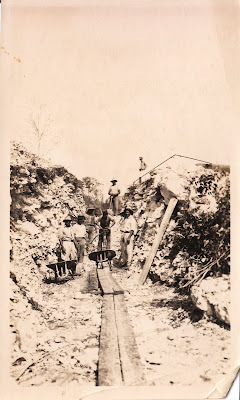 My grandfather remained in camp and later in the day, in rode Pancho Villa & his crew. 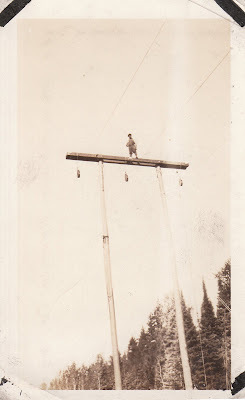 They told my grandfather that they were going to kill him. 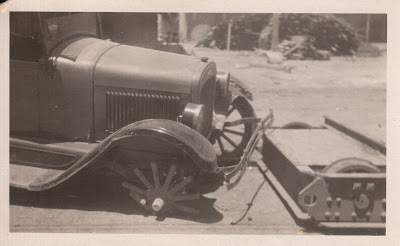 My grandpa suggested that before they kill him they may as well have some cocktails :-) Once drunk, he told them to take whatever they wanted from the camp, and the revolutionaries rode off leaving him tipsy, but alive. We believe this story and the timeline fits when Pancho Villa and Zapata where in the area of Mexico City. I had hoped of finding some photos, but I suppose no one would have been in the mood to pose for photos. So, the story remains family lore. I love how the Phoenix guys wear khaki pants and linen shirts. I'm pretty certain that doing that laundry was no fun. 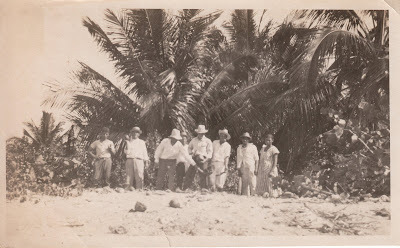 In one of the photos, there is a line indicating which guy is my grandpa. 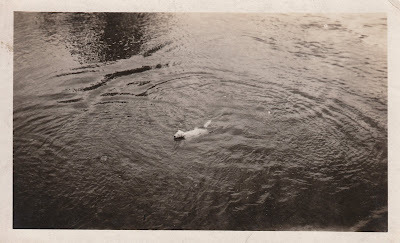 Another photo, my grandpa labeled "my dog." At any rate, I'd imagine that this is much of the same process that brought electricity across the US. It's also interesting to me that this is what was going on in the world when Stuccohouse was built. Well, that was fun. Yesterday I ran into a little boy from down the street with his mom. This little guy is probably about 4 years old, smart as all get out and quite social. I always enjoy chatting with him and catching up on what is new in his life. I asked him if Santa had been to his house. He told me that Santa had indeed visited and even brough him some things he did not ask for. He was pretty sure this was a sign that he had been a very good boy and his mom agreed. I mentioned to him that right before I went to bed, I had looked out my upstairs window and down the street and thought I saw some lights - one of them red - over his house. I was thinking that maybe that was Santa at his house....and Rudolph too. But I didn't get a real good look. He thought about that for a second and then told me that he had heard a big thump (clapping his little mittens together to show me how loud) on their roof at about that same time. He also was pretty sure he had heard something in their chimney. I just received this flyer in the mail. 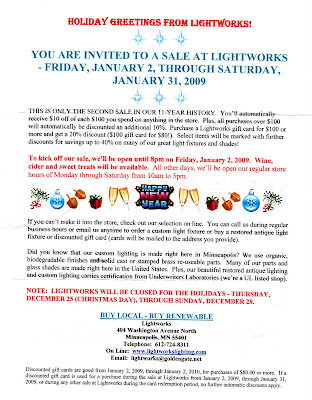 Lightworks is having a sale starting Jan 2nd. I really like this place. If you live in the Twin Cities and own an old house, it is a must stop. Over the years, I have had them build me a new hallway light to order, purchased a set of vintage sconces, and talked to them about building an outdoor light to fit in the odd spot over my front door. I regularily stop down there (and their website) just to oogle. You can bring them a photo or idea and Lightworks can build you what you want to order....at about the same price as those guys out in Oregon ;-). Best of all, they are local. I notice they are offering gift cards at a 20% discount, which makes me think that might be a good idea for those rooms where I haven't decided what I want yet. Like every other state in the nation, this weekend Minnesota was pommeled with snow. 6" or so when it was all said and done. Rather than deal with the nightmare that is a Minneapolis Snow Emergency, I parked my car in my garage (after some rearranging) and looked for a project inside to keep me busy. 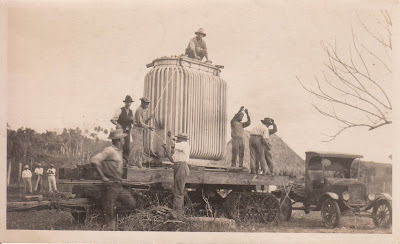 During the early 1920's my grandfather went down to Mexico, Honduras and Cuba for a number of years to work on installing their electrical infrastructure. While down there, he mailed home photos. Lots of them. These photos are currently in a pile, on a table in my living room. They are in boxes and photo albums that are falling apart. At some point, someone took some of the photos and glued them onto both sides of pages in photo albums. At some later date, someone thought better of that and tried to peel some of them off. 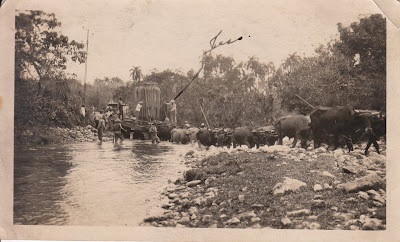 Surprisingly, though, the photos are in really good condition. There are maybe a hundred or so of them. Some labeled; most not. While this project is not strictly "house"......it is nice to see how electricity did actually make it to our houses....and the work someone had to put in to make that happen. My job, is to take these photos....arrange them, try to determine the location, and get them into new (acid free) albums that can be enjoyed and will prevent any further damage. I know the old album paper is not acid free, but the photos are so tightly attached, that I am cutting down the background and then sliding them into plastic sleeves. I know about soaking old paper in distilled water....and that special (oh-so-expensive) spray that neutralizes paper, but I am afraid to use them on these old photos. I am hoping that my readers include some history buffs and/or scrapbookers with tips, ideas, etc. I am scanning some of the more interesting photos (and will post some in a day or so)....and most of the duplicates will remain stored in a box. Tee hee. Here is my latest purchase from Ebay. I was just notified a few minutes ago. I've been closely watching these for months now. For a while there were a couple of buyers that desperately wanted a pair and drove up the prices. But I patiently bided my time. Once those folks got their set, interest waned. I was the only one to bid on this pair. 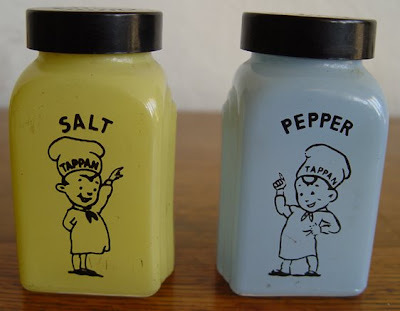 These salt & pepper shakers were premiums given with the purchase of a Tappan stove in the 1940-50s. They are made by McKee and are called "Roman Arch" stove top sets. Of course, they are destined to sit on top of my vintage Tappan Deluxe. There is another style of Tappan shakers that are called the "Tappan chefs." They look like little Pillsbury Doughboys. My research tells me the chef shakers were a later design. There are quite a few fakes out on the market of both types, so I'll have to take a closer look when they arrive. But usually the yellow color on the fakes is off.....and this photo looks to be good. We'll see. Ugh. Back in October I went to look at wood framed Marvin storms for my two kitchen windows. Earlier in the summer I had removed the horrid aluminum triple track storms and put up two temporary vintage wood screens. With winter approaching I knew I needed to do something. The choices I was considering.....were having two vintage style storms made for the windows like I did for my two front windows. This meant either adapting to the storms swinging out & screenless during the summer....or changing out the storms with screens seasonally. The other option was to put in wood framed combination storms. I had already seen a number of options and Marvin was my last stop. For whatever reason, I have not been able to pull the trigger on this. I still have not decided....and I still have not bought storms for those two windows. Last night it was -15 degrees f. Jack Frost is nipping at the inside of the windows (those are little wood apples in the photos). This is not good. I may have to spend some time this afternoon, doing what I vowed I would not do this year. Putting up some 3M shrink weatherproofing plastic. Ugh. This is my front window. It still has the metal mini-blinds that were there the day I bought the house. Based on PO photos, they are at least 11 years old. They may have looked fine with the room when the walls were painted cream. They do not look so good with the walls painted gold. When I first moved in I had the same mini-blinds in the kitchen, dining room, casement windows on the side of the living room and my front door. In the kitchen I replaced them with white & green cotton cafe curtains. In the dining room, I put up vintage lace. On the casement windows, I used moss green sheers. And on the front door, I had a vintage striped canvas shade made. I've ignored the front mini-blinds until now. But, they are really starting to bug me (note the bent blinds where the PO's dog looked out the window). I have a few ides of what to do with the window, but want to make sure I don't overlook any options. If this was your window, what would you use to replace the mini-blinds? A few details if they help: I need some privacy from the high straffic sidewalk out front. The window gets a lot of sun. Room colors are - gold paint & chair, moss green couch, deep red chair, and navy blue accents....all brought together in an oriental rug. There is an unstained oak floor, walnut stained baseboard, room divider, crown and doors. Hardware is oil rubber bronze. The cream lampshade can go. I woke up this morning in the wee hours to the sound of snow blowers and shovels. Ugh. I was dreading getting up because I knew what lay ahead for me. One of my kind neighbors took a pass down the entire block with his/her snow blower. They even cleared the little walk to my car. All I had left to do was shovel my steps down to the main sidewalk. Just the perfect amount of shoveling to get you outside but remain enthusiastic about the snow. Just a few random loose ends. First, does anyone have an opinion/advice/experience/warning/praise for half round gutters? My gutters need to be replaced and I'm kind of considering something like these gutters. With cute rater tail brackets like these. I don't have much gutter on my house....one run of approx 16' and another of maybe 30' across the back. I also have typical bungalow wide eaves. But, I do have trees that drop a lot of leaves. What do you think? Lastly, I discovered Facebook & LinkedIn. And Ravelry. Because I clearly do not spend enough time online already. If you know me in "real life" drop me a line if you are on either.